Water-use patterns in cities are complex and the quality of water required for a particular use is unique. Along with the residential population, cities host industries and commercial sectors, which already pay higher tariffs for water, even with limited supply assurance. As much as 60 percent of major industries are impacted due to water scarcities. In addition to water supply augmentation, wastewater treatment offers new economic opportunities for energy and fertilizer recovery. That said, investment in wastewater treatment has associated risks as well. It is important to understand the underlying factors that will drive, facilitate, and sustain wastewater management interventions in India. 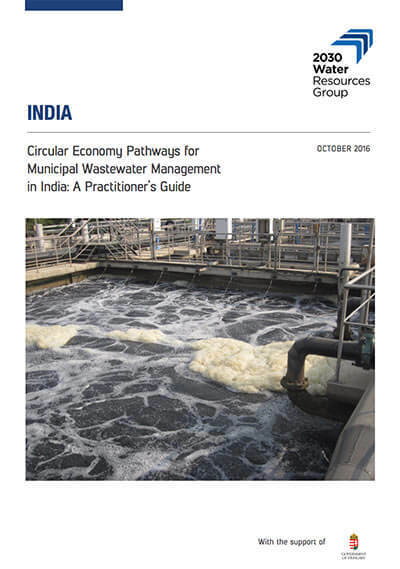 This practitioner’s guide identifies relevant practices for India, based on the status of global thinking (17 global cases studied, see figure i above) on the adoption of a circular economy pathway in the wastewater sector. At this point, India is still to recognize and exploit the opportunity for wastewater circular economy. In several areas, untreated wastewater is used for irrigation, although there are cases of exemplary wastewater reuse and energy recovery. Nutrient recovery, again, is a practice that has not yet been attempted at recognizable scale in India.